It’s very early Saturday morning, on the last weekend of January, and the University of Guelph’s student centre is quiet. A group of volunteers wait out in the cold to be let in to start their volunteer duties. The conference organizers, Tomás, Kerry and Holli soon arrive and we all hit the ground running. It’s set-up duty and soon the mass of 150+ exhibitors will be rolling down Wineguard Walk looking for a place to unload. Volunteers are standing in the freezing weather directing traffic (well bundled if they’ve done this before), while others are helping exhibitors unload their vehicles and set-up their booths. The energy is electric. As more exhibitors arrive the main floor and basement of the building grows more hectic as people rush to set-up their booths in time. By 8:30am nearly everything is all set-up and the 2,000+ crowd of people expected over the next two days begin to trickle in. Since 2011 this is how my weekend started for the Guelph Organic Conference. Recalling the memories I am filled with excitement, as this is by far one of my most look-forward-to weekends of the year. I can’t help but feel the impact of my first conference and the ways it helped forge my path in the organic sector. As Canada’s biggest organic conference I bet it has played similar roles in other people’s careers, lives and passions for organics. What many people may not know is that the conference is not just the two day trade show. It is actually a four day event with so many things to see and do that often it’s hard to choose! Thursday and Friday typically offer more advance training seminars during the day. Thursday and Friday evening festivities offer organic food and wine, giving people a chance to network, make new connections, or catch up with friends and colleagues. Friday evening also features a keynote forum where a hot topic is presented by a group of people chosen for their knowledge on the subject. 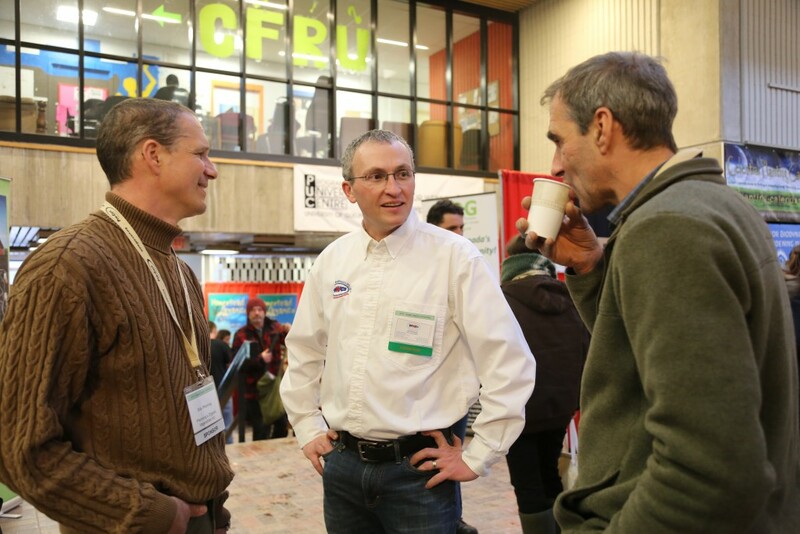 This year’s keynote is titled “The Face of Organic Farming: Innovation, Vision, Change”. The panel has been chosen for their commitment to organic agriculture. Ekk Pfenning has been asked to participate on the panel and will be speaking on the changes Pfenning’s Organic Vegetables Inc. has experienced, and how innovation and vision have allowed for those changes. He will be joined by Pat Kozowyk from Babalink Organic Farm, Dag Falck of Nature’s Path Foods, a panelist featured from The New Farm, and Sarah Dobec from The Big Carrot as moderator. It is sure to be a lively discussion! Come Saturday morning and the gang from Pfenning’s will be gearing up to juice nearly 1,000 lbs of fresh carrots throughout the weekend. With our booth all set-up and our aprons tied tight we will turn on the juicer with a loud whir. Once the trade show is in full swing the Pfenning’s booth is a buzz of activity. The sound of the juicer is unmistakable when paired with the smell of fresh carrots in the air. 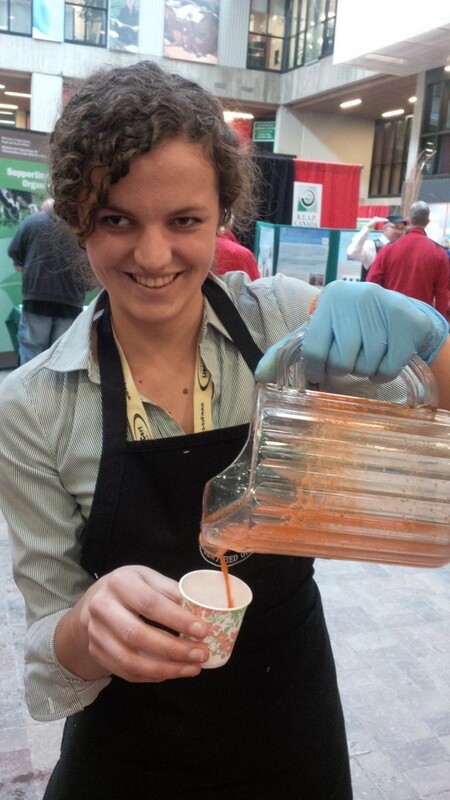 We love interacting with our consumers and they love our sweet, wholesome carrot juice. Barbara’s jug is empty, time to juice more carrots! Saturday and Sunday are two days teeming with all sorts of different things to do and see. The trade show has everything from advocacy groups to regulatory bodies, farm equipment dealers to retailers, and everything in between. My friends particularly like visiting the heirloom seed dealers for their backyard gardens; it’s a great start to planning for spring planting. 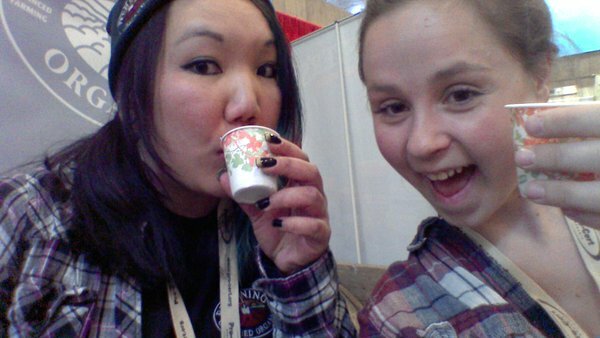 My favourite are the trade show deals for the everyday items that I will stock up on. Items like pickles, jam, spices, miso, apple cider, chocolate, even personal care products like soap and toothpaste, the selection of your favourite organic products from companies across Canada. Umesh, one of our field managers, is going to learn about Analyzing cover crop options for large Ontario farms and Creating nutrient density with soil regeneration. Justin, our HR Specialist, is checking out what Tony and Fran McQuail have to say on Building a ‘forever’ organic farm: Keys to success/blueprint to longevity. For my part, I am presenting a workshop in collaboration with Colleen Haskins of OMAFRA, Food safety on the organic farm: Preventing contamination. Also, throughout the busy Saturday and Sunday, are numerous trade/industry meetings. Depending on your intersection with the organic community there may be something of interest to you. Check out the 2016 Meet & Greet page. Because there is so much going on there really is something for everyone. If you work in the industry it is a great networking opportunity; if you care about organics it is a great place to learn more; if you are an organic consumer the free trade show is an excellent way to meet the people producing the items you love. 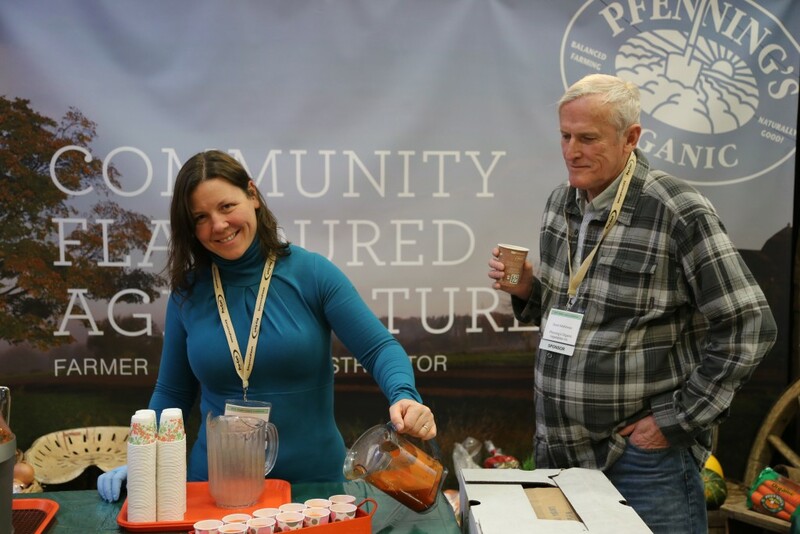 So come to the 35th annual Guelph Organic Conference this upcoming weekend and visit our booth for some refreshing carrot juice and let us know why you love the conference too!